This entry was posted in Campus Announcement and tagged Recreation and Wellness Center on August 19, 2013 by Wire Eagle. 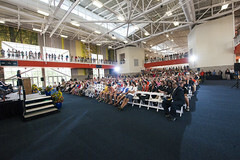 AUBURN UNIVERSITY – Auburn University opened the new 240,000-square-foot Recreation and Wellness Center with a ribbon-cutting ceremony today. Students, faculty and staff got their first look inside the $72 million facility which includes the nation’s longest indoor running track, a five-story rock-climbing wall and a 45-person tiger-paw-shaped hot tub. Large murals of landscapes, waterways and other nearby outdoor settings are found throughout the center. The courtyard – a tranquil area featuring benches, plants and a water fountain – brings the outdoors into the center. It is surrounded by racquetball courts, weight training areas, group exercise studios and other center amenities, including a large outdoor pool and leisure area; cardio/fitness training areas; eight basketball courts; a golf simulator; strength equipment; a multipurpose court; outdoor recreation; and a game room. The grand opening ceremony was the culmination to what began in 2009 under the leadership of then-SGA president Lauren Hayes. Auburn students voted to assess themselves an increase in activity fees, raising funds to help build the $72 million project. The new center is located across Heisman Drive from the Village Housing Community and is adjacent to the Martin Aquatics Center and Student Activities Center. 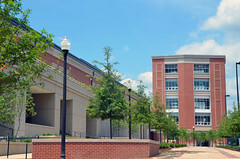 It complies with green building, or LEED, standards, reinforcing the university’s pledge to make sustainability one of Auburn’s guiding principles. 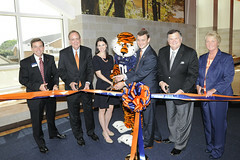 For more information about the Recreation and Wellness Center, go to https://cws.auburn.edu/campusRec.